One of the problems consequent upon �good ideas� is that they can cause the basic facts to be overlooked, particularly where the �good idea� is only half carried out. Such half-effected ideas produce half-cocked results and at that point the law of unintended consequences takes over. We are told in the accompanying booklet that the producer intended the production "... to familiarize a modern audience ..." with the "... mythical dimension of the subject matter" depicting Don Giovanni "... travelling through time ...". Fine. I have no problem with that. But wait. He is only accompanied "... on his time travels ..." by Donna Elvira. Donna Anna and Don Ottavio "... display many fewer facets ... Comprehension of their roles ... owes more to the detailed evolution of their gestural language than to changes of costume." And that fails to mention or justify the greyed-over colouring which envelops so many scenes. At which point the law of unintended consequences says that more time will be spent looking at costumes, trying to date them, identifying the anachronisms and marvelling at the extravagances, than thinking about any time traveller. And so it proves. However, what any half-effected idea cannot do is impinge on the beauty of Mozart�s music here under the superb control of Maestro Muti. The Viennese Orchestra responds stunningly to his dynamics, phrasing and tempos. Just occasionally the speed is almost breakneck but none the worse for that. With the singers, the orchestral volume is turned down and Muti, singers and orchestra produce some positively delightful sounds. Carlos Álvarez sings the title role. And for Act I that is about it. It is done with glorious voice, commanding tones and vocal security second to none. But where is the ever-present frisson of sexuality and undercurrent of violence? Where is the magic in the attempted seduction of Zerlina? This uptight Don may reflect nobility�s formality but he would never produce a �catalogue�. In Act II he laughs twice, smiles several times and relaxes considerably but the only sign of the swash-buckling devil-may-care anti-hero whose code of honour insists he accepts the Commendatore�s invitation, is when he swaps roles with Leporello. It is as if he cannot �relax� as himself. 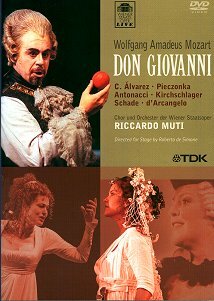 On the other hand Ildebrando d�Arcangelo as Leporello is on excellent, if to my mind somewhat over exuberant, form. This �Jack� certainly thinks that he is �as good as his master� right from his irritation, not boredom, in the opening scene. He almost moves the centre of the plot to himself, particularly in his superb self-exculpation in the sextet. He gives a strong and deep-toned performance; no wonder that in other productions he has been cast in the title role. The voice and acting of Adrianne Pieczonka as Donna Anna is truly of the wronged woman. There is vocal power in plenty which when delivered forte loses much of its beauty. Fortunately full power is rare; it is not needed. Even half power is quite adequate so that the beauty of tone is retained. In her lower ranges Pieczonka delivers some seriously dark colours � for example in Non me dir. In the last scene, with Michael Schade�s Don Ottavio, she produces as smooth and as gentle a sound as one could wish for. With Schade she controls her strength of sound so as not to overwhelm. His is not the power-house tenor, particularly at the lower end of his range. This is managed (disguised) well by ensuring that when he is about to descend there, his preceding higher range notes are delivered piano to avoid the contrast. But he knows well how to present colour and dynamics; his almost sotto voce delivered Il mio tesoro intanto, with silken orchestral support, is to be savoured. This is an excellent intense performance, by a popular regular at this theatre in what I always think of as a fairly miserable role. Anna Caterina Antonacci (a wonderful tongue-rolling name) is a vibrant Donna Elvira, supremely characterising the wronged and faithful love. If there is too much vibrato, her vocal runs and leaps are delivered with comfortable assurance and security. The demanded wide tessitura is not a problem: seriously smooth head-to-chest sound-transfer appears second nature. Her interplay with others is outstanding: resentful and reproachful of Giovanni and girlishly playful with the �disguised� Leporello. This is an attractive warm-sounding and vibrant Donna Anna. This leads directly to Angelika Kirchschlager: yet more serious attraction but here as Zerlina the scheming lower orders wench. Batti, batti and Vedrai, Carino are delivered with clarity of voice second to none. Poor Masetto would stand no chance of resisting this physically and vocally playful Zerlina. However her last scene costume would bring him down to earth. There is nothing attractive about an early 20th century working class outfit and style. But I will return to costumes in one moment. Lorenzo Regazzo as Masetto gives a competent but not compelling performance. Sometimes he seems not sure whether to be a buffo character or a simple peasant. There is almost a blackness to his tone which does not ring out - or did he control it for characterisation? - compensated by a crispness of diction. Not a word is missed. For me, Franz-Josef Selig does not have sufficient heft as the Commendatore. A rich tone certainly but not the mass of sound to overwhelm Don Giovanni. The graveyard scene therefore lacks the power one expects � not helped by an unconvincing set; where are the gravestones and why two statues one of which speaks and the other nods? The set (only one) has central steps, moving flats half way up them and frequently changing back-drops � sometimes dropping after the start of a scene. It is a great set for certain stylised moments of picture painting. Foolishly I presumed the "top landing" area would open in the final scene and Giovanni would descend into flaming hell. Well, no actually, lots of stage smoke at the rear and he staggers off into that. So why the steps, which give movement difficulties for all, especially Donnas Anna and Elvira with trains on some outfits? Perhaps this is intended to reflect the order of society with the scenes for Masetto/Zerlina for the most part occupying the bottom of the steps/front of the stage; if so it is symbolism taken too far. Finally those glorious, stunning, bank-breaking costumes, wigs and hats. Donna Anna�s last hat was so stunning that Ascot came to mind immediately. Totally wonderful and great in conception as costumes but sadly not achieving the purpose intended. Will the production familiarize the audience with anything? Yes: Mozart�s magical music under Maestro Muti. As for the concept of familiarization with the myth, in my opinion the production fails. Frequent opera-goers do not need the lesson and first time attendees should not be confused by time/costume changes which only affect some of the cast some of the time with consequential obfuscation.